A day in the field for our staff can be filled with many different experiences. Much of our time is spent focusing intently on reading the behavior, tracks, and sign of beach-nesting birds as part of our monitoring and protection program. Some days are filled with a sense of pride and purpose as we watch chicks we knew as eggs learn to fly. Other days, we are shocked and outraged by what we witness. Yesterday was one of those days. We regularly monitor a 1 mile stretch of beach along the south shore with several species of nesting birds. We often clean up the beach as we walk back after monitoring the birds. On any given day, we find trash. Yesterday, however, we found more trash than we could handle. 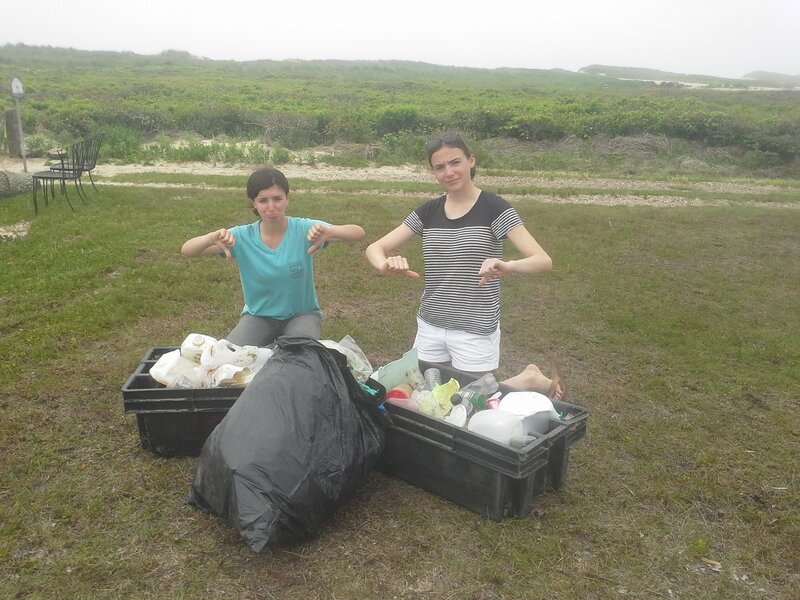 Three of us were only able to clean half of the mile-long beach because we simply couldn’t carry anything else. Recent storms washed trash onto the entire south shore of our Island. What kind of trash did we find? Primarily balloons, plastic food and cleaning containers, and glass bottles. We filled two large tubs and a garbage bag. As we hauled our load back to the parking area, we had plenty of time to talk trash. We discussed the huge gyres of trash in the pacific ocean and steps we thought everyone could take to reduce plastic use. Our convenience-based lifestyles produce a lot of trash and recyclables. If we don’t change our throw away or “it’s ok if I buy it because it is recyclable mindset,” our oceans will continue to fill with this debris of convenience.